The decibel unit does not merit the extensive bewilderment which it attracts. Electrical engineers who need to understand what a decibel is, and how to use it, need not panic - it really is fully comprehensible. What's in a name? 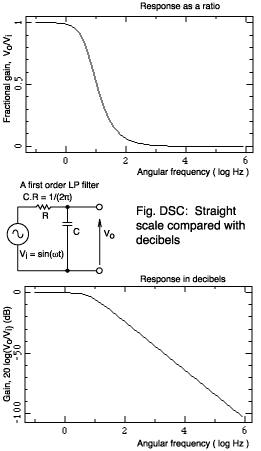 - how the decibel got its. The name decibel honours the inventor of the telephone: Alexander Graham Bell, in recognition of his work in acoustics. Sound intensity levels are frequently specified using decibels. Quasimodo's famous exclamation "The bels! The bels!" was, in fact, a reference to the sound intensity. As a unit of measurement the decibel is peculiar in two ways. Firstly the 'deci' prefix (meaning 0.1) is, unlike its smaller relations milli and micro, almost unused, except when a volume is given in 'cubic decimetres'. Just be clear that if you have n decibels (dB) that means you have n/10 bels (B). Secondly, if the metre is a unit of length, the kelvin is a unit of temperature and the henry is a unit of inductance then what is the decibel a a unit of? For the purposes of exposition we'll invent a quantity called lorp (logarithm of a ratio of powers) and give it a symbol ð.
Decibels are so easy they're boring. What is the reference power level? The answer is 'any level which is both convenient and made clear to everyone'. A particular ref level will usually fall into one of the three types in the list below. If this confuses you then try clicking the asterisks to get an example for each type. You often know what Pr is by the context in which the lorp is specified, but sometimes the units are changed to 'dBx' where the x is some letter or symbol indicating what Pr is. * A power in your circuit at some point which is separate from the point at which Pc is measured but which is present at the same time as Pc. * A power in your circuit at the same point at which Pc is measured but which is present at a different time or under different circuit conditions or with a different measurement method. * A value of power which is fixed in absolute terms. In other words its 'gain' is -5 dB. You are comparing a power in your circuit at the same point at which Pc is measured but which is present at a different time or under different circuit conditions or with a different measurement method. If the first antenna happened to be a dipole then you would say that "the gain of antenna 2 is ð2 dBd"; the suffix d indicating that the comparison is with a dipole. If the gain is given as 'dBi' then the comparisson is with an antenna that radiates energy equally in all directions (an 'isotropic' antenna). Later in the design of your communications system you become interested in the purity of the signal. You use a spectrum analyzer to look at the received power at the fundamental frequency of the transmitter and call that Pr. Next you look at the power at twice this frequency, the 'second harmonic', and call that Pc. The lorp in this case is denoted by dBc, the suffix indicating that you have taken the power of the fundamental or carrier frequency as your reference. Here Pr is established by convention. In acoustics, for sound intensity levels Pr is sometimes 10-2 W m-2. This is about as loud as a pneumatic drill two metres away. More usually, Pr is 10-12 W m-2, which makes the drill 100 decibels. On this scale 0dB corresponds approximately to a whispered conversation. This illustrates how wide the range over which our hearing works and why a logarithmic scale is useful. Audio engineers like to use dBu, where 0 dBu is 0.775 volts RMS (1 mW into 600 ohms, see the next section). As it is often easier to make voltage measurements than power measurements you may wonder if lorp can be calculated from the former. Remember, though, that this equation is only only applicable when the impedance fed by Vr is the same as for Vc. Look at the decibel equivalents for a power change of 2.0 and for 0.5. If you double or halve the power then this gives very close to 3 dBs. This is only coincidence, but it explains the frequent references you see to 'the -3 dB point': it really means half the power. OK, so now you know how to use decibels, but perhaps you don't see the point of doing so. After all, if you can do nothing with them except express a ratio then why not say "my output power is 14 times my input power" rather than "my amplifier gives 11.5 dB". Well, clearly it's quicker to do the latter. It's also convenient to label graph scales in dB. In Figure DSC you might not agree that the decibel scale is more informative but it surely gives a different slant (ha ha) to the response. Mostly, though, it is the logarithmic nature of the unit that has ensured it's survival. Communication systems, as with acoustics, tend to operate over a large dynamic range and decibels cope with that. Acoustically, the human ear perceives sound levels in a logarithmic fashion; so you 'feel' that an 18 dBu sound is about three times as loud as a 6 dBu one, even though the power ratio is nearly 16 times. The use of decibels is also partly for historical reasons. When a communications engineer had, let's say, an 11.5 dB amplifier followed by a 5 db attenuator he could quickly calculate that the overall gain was 11.5 - 5 = 6.5 db. This works because adding logarithms of ratios corresponds to multiplying the straight ratios: 14 * 0.316 = 4.42 (this was the rationale behind 'log tables'). With a hand held calculator it's as quick to do the multiplication anyway. If you can understand logarithms then you can understand decibels. So why do they cause confusion? One problem is that statements like "The output power is 15dBm" are very common. The trouble with this is that power is measured in watts, which have dimensions of joules per second, whereas decibels are dimensionless. Watts are not really decibels of any variety. Life is too short, however, to be pedantic by saying "Ten times the logarithm of the ratio of the output power to 1mW is 15dB". Just make a mental note of the pitfall, say that "The output is 15dBm", and get on with the job. The final way to go wrong is to attempt to use type 1 reference levels when the circuit impedance is not the same for both Vc and Vr. Rather, in fact, as with figure DSC. This page goes no further into such murky and uncharted waters. Last revised: 2016 March 10th.